Pain. Fatigue. Malaise. These symptoms are just part of life when you have fibromyalgia (FMS) or lupus. When you have both fibromyalgia and lupus, you get a double helping of those symptoms, in addition to the other symptoms of both conditions. FMS and lupus are both hard to diagnose, and because their primary symptoms can be very similar, people with FMS are sometimes misdiagnosed as having lupus, and vice versa. A sizable number of people have both conditions, which complicates diagnosis and treatment. Therefore, it's important for those with FMS to be familiar with the symptoms of lupus. Lupus, also known as systemic lupus erythematosus (SLE), is an autoimmune disease. That means your immune system malfunctions and attacks your healthy tissues as if they were a dangerous virus or bacteria. Lupus can take different forms and can attack any part of your body. Its most common targets are the skin, joints, heart, lungs, blood, brain and kidneys. We have several treatment options for lupus, but there's no cure. Most people with lupus can manage their symptoms to some degree and don't face life-threatening complications. Those with certain complications, particularly kidney involvement, have a lower survival rate. Treatment generally involves suppressing the immune system, which slows down the attack on whatever parts of your body are involved. However, it also increases the risk of serious infection. Lupus causes inflammation, pain, and tissue damage. Its course is unpredictable, and symptoms can come and go in a series of flares and remissions. While lupus and FMS share some features, FMS is not known to be an autoimmune disease, and it doesn't cause tissue damage. Some cases of FMS may involve inflammation, but the research on that is still in the early stages. People with FMS don't appear to be at a higher risk of developing lupus, but people with lupus do have an elevated risk of developing FMS. So far, we don't know why. It's possible that the pain of lupus leads to central sensitization, which is a key feature of FMS. Until researchers pin down the causes of these conditions, we likely won't understand their relationship to each other. Like FMS, lupus is hard to diagnose. No one test can pinpoint it, and because symptoms can vary widely from one patient to another, it's hard for a doctor to recognize. Before diagnosing lupus, your doctor will likely give you a physical exam, look at your flare patterns, run tests to rule out diseases with similar symptoms and do what's called an "antinuclear antibody" (ANA) blood test. If those tests are positive, it usually results in a diagnosis of lupus. If you've been diagnosed with FMS but haven't had an ANA, you may want to ask your doctor to run the test to rule out lupus or other autoimmune disorders. Lupus, however, comes with inflammation in the joints, while inflamed joints aren't. Both conditions are associated with many other symptoms as well. It takes some experimentation to find the combination of medications and lifestyle changes that work best for you. While it's certainly more difficult to treat two conditions, lupus treatments don't generally have a negative impact on FMS, with the possible exception of steroids. Some FMS experts believe that steroids can exacerbate FMS symptoms. Be sure to check with your doctor and pharmacist about possible drug interactions, as well. The lifestyle changes recommended for the two conditions are very similar, so you could get a double benefit from making those changes. Living with both lupus and FMS is difficult, and it's likely that a lot of your time and energy will be consumed with trying to stay as healthy as possible. We're learning more about how to treat and manage both conditions, however, and new discoveries may help you maintain your functionality and quality of life. To help you live with these difficult conditions, you may want to learn more about pacing yourself and eating a healthy diet. American College of Rheumatology. All rights reserved. 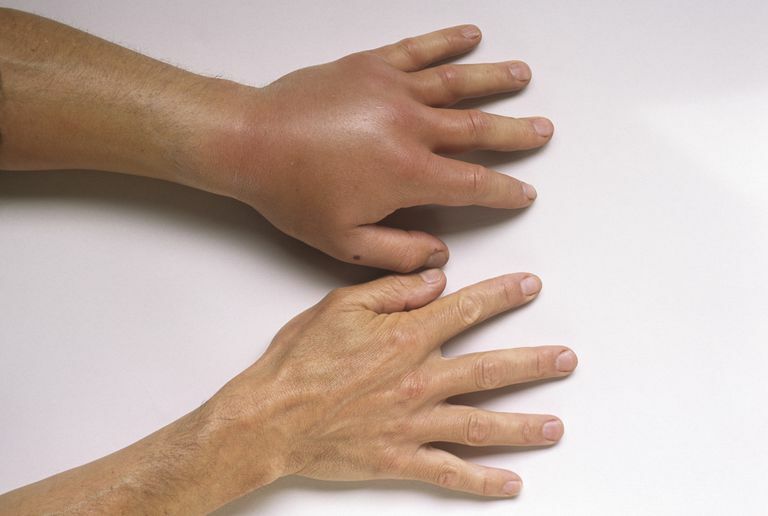 "Systemic Lupus Erythematosus"
The Johns Hopkins Arthritis Center. All rights reserved. "Lupus Information"
National Institute of Arthritis and Musculoskeletal and Skin Diseases. All rights reserved. "Lupus"